Pacific Coast Arborists & Consultants is a four-year-old company that operates out of Foothill Ranch, Calif., and serves the Orange County area. Home to more than 3 million people and Disneyland, the region was popularized through the Fox television series "The O.C." Founder, owner and operator Brandon Elrod had many years of experience when he considered developing his own company. With a degree in ornamental horticulture, he has worked in landscape architecture and has managed the tree services division of a landscape firm. He felt creating a new firm specializing in tree care alone would benefit clients in several ways, one of which concerns the fact that arboriculture isn't considered a skilled trade in his region. That means that people without proper credentials, education or training may perform pruning and other services. That perspective, and his primary interest in arboriculture, gave him the vision that became Pacific Coast Arborists & Consultants. "The very first challenge was that I did not want to build a residential tree pruning company, even though it is the easiest to fund as a start-up" Elrod said. His target market was commercial concerns and community associations. That focus came with a large obstacle: cash flow. While residential customers can be expected to pay upon a job's completion, corporate clients require an invoicing process that can delay payment as much as 45 days. That's an eternity for a young company that must cover its own expenses. Enter fellow arborist Ruben Green,who provided capital to get the ball rolling, and Pacific Coast Arborists & Consultants was born. The men invested time in creating a solid corporate model to ensure that the firm's principles were grounded in sound business practices that could carry it through infancy and the growing phase. With the assistance of a public relations firm, the Pacific Coast Arborists & Consultants brand was defined and supported with professional logos, brochures and a Web site (www.pacificcoastarborists.com). "We believe that first impressions are critical when it comes to marketing" Elrod said. The company joined several industry associations, including the Tree Care Industry Association (TCIA) and the International Society of Arborists (ISA). Focusing on home owners' associations, resorts and office parks, the firm provides a range of services, which includes planting trees.Elrod says that it's an unusual offering in his area. 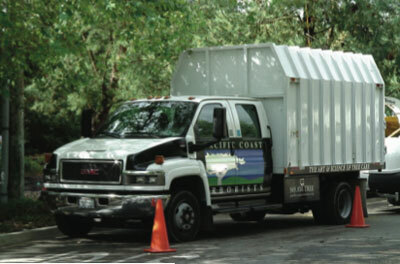 Pacific Coast also supplies tree fertilization, insect and disease control, removal and pruning. GPS tree inventories and consulting services may be provided throughout the state, but the field crews stick to the Orange County area. Tree health care in Southern California involves several palm varieties. The firm follows sound guidelines in pruning these specimens by industry standards. Typically, palm pruning includes the removal of brown and yellowing fronds, flowers and dates, but each cultivar has special needs. With Canary Island date palms, for example, only sterilized handsaws are used; chain saws don't touch these trees due to a localized fungus problem. Although chemical treatments are available, California law prohibits their use, so arborists must take special precautions to prevent the spread of the fungus. "The safest way is to use a new saw for each tree,which some clients require" Elrod said. That seems extreme, until you price Canary Island date palms. Elrod said they run $10,000 to $15,000 each. That's because they are rarely nursery grown, so acquisition means finding a home owner to part with one. Removal of large, mature palms requires a crane; typically, fresh soil must be added to the new planting site. Elrod particularly enjoys working with clients to establish comprehensive tree care management plans, complete with budgets. He said that some of his clients, such as home owners' associations, are established communities with numerous trees,but have never had a formal plan of care. 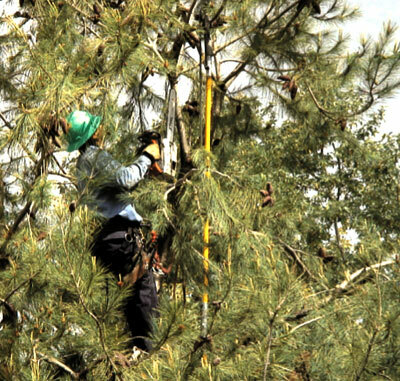 Specific tree care plans are based upon the client's need for safety and/or image maintenance. With commercial properties and planned residential communities, both factors weigh in and must be balanced. Tree age must be considered as well. When the need to achieve design consistency or to reflect a company's values is most important, that factor weighs more heavily. Poor soil conditions in Southern California represent the greatest challenge Pacific Coast Arborists & Consultants faces. Brandon described the soil as construction-grade, saying he must successfully plant and nurture trees in depleted soil. That requires extensive amendments; in this case, mycorrhizal applications are employed due to the extreme conditions. Given the poor soil quality and the fact that only coastal live oaks and sycamores are indigenous to the area, tree selection can be difficult. The landscape was virtually treeless until the area was settled. Popular tree choices today include palms, pines and eucalyptus. 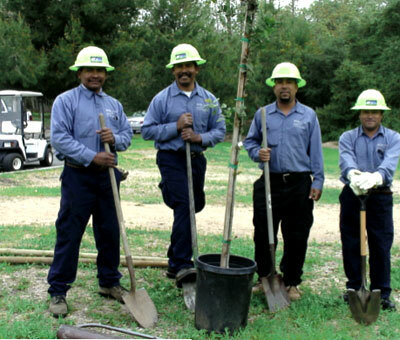 Elrod's company has three certified arborists on staff, and employs certified tree workers as crew leaders. Support staff includes a senior consulting arborist and a GPS technician. He believes investing in good equipment and properly maintaining it is actually a method of supporting his crews. "Very few things derail employee morale and performance like being expected to perform on budget when the equipment won't function properly" Elrod said. The positive impression that clean, well-maintained equipment makes upon established and potential clients is equally valuable. Field arborist Joe Lopez is the company's safety trainer. He coordinates annual training events known as arborist boot camps. The field employees go to the mountains for several days of training to earn safety certifications. The outings also serve as a chance for employee bonding. Training is offered on first aid, CPR, electrical hazard awareness, aerial rescue and chain saw safety. "[Lopez has] diligently focused on creating a culture of safety-minded employees" Elrod said. The training doesn't end when boot camp does. Pacific Coast holds weekly safety tailgate meetings that focus on topics emphasized by the TCIA. Every employee has the opportunity to lead a meeting to help create a participatory environment, rather than offering another lecture. Elrod noted a disturbing trend among his fellow arborists. He believes too many become complacent and don't continue to develop, update and strengthen their skills throughout their careers. He believes this will weaken the industry overall, and make it difficult for professional, reliable tree service providers to maintain positive images in the marketplace. Elrod is backing up his belief by working to promote arborist education within his community. The local community college has launched arborist training programs. Elrod is serving on a technical advisory committee to guide the program, which he hopes will offer certificates in the future. 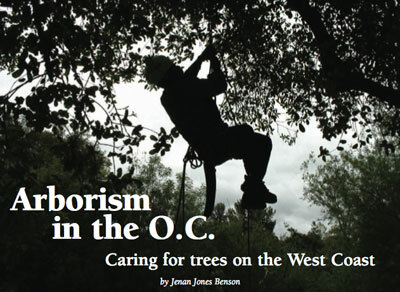 "It has been a pleasure working with Brandon Elrod, of Pacific Coast Arborists. Over the past several years I have come to rely on his expertise and integrity and have referred him to our company's largest clients. When I was manager of a high profile master association, he was always willing to go the extra mile to meet my client's needs. In an annexing community, he responded the same day to a request to trim around the developer's marketing signage throughout the association. These experiences and others demonstrated that I can count on him to get the job done and to make sure that it is done the right way. "